Guinevere's (my rescued Meller's chameleon, who I've mentioned quite a bit on the blog over the last year and a half) mouth issues seem to be returning. As you may remember from all the previous blogs on the subject that she came to me with a respiratory infection, mouth rot/stomatitis, and an infection in her right eye. It took us about 6 months of Baytril, Silver Sulfadiazine, Tobramyacin ointment, and several other products to clear everything up. Now it seems like the stomatitis has returned and her gums are once again swollen and sensitive. The first thing I would recommend in a case like this is to go to the vet for some proper antibiotics. (I don't want anyone to think I'm advocating not seeking professional help in the case of an injury or infection, or to seek out home-remedies unless you are experienced and/or have some professional guidance. I have several vet friends that I consult with, so I run most of my plans through them first.) And it is still something I plan on doing down the line if I need to, however, because antibiotics like Baytril are particularly hard on sensitive chameleons like T. melleri, I want to hold off for the moment. reptile world that traditional medications can have limited success and debilitating side effects. not intended to diagnose, treat, cure or prevent any disease." So the claims are pretty bold, right? It treats all types of infections and even claims to fight tough parasites like coccidia. But others claim that it is the first product they reach for when they have a mild infection (like a respiratory infection) in a chameleon and that since they've started using it they haven't needed to use antibiotics in several years. So ok, color this skeptic intrigued at the very least. Lets give it a try then and see what happens. I ordered the XL version because it is for reptiles over 250 grams in weight, which all the Meller's are. If you have a typical panther or veiled you probably will not need this size. So today, on July 23, 2014 I started Guinevere on her first dose of Reptaid, along with a few CCs of Carnivore Care. 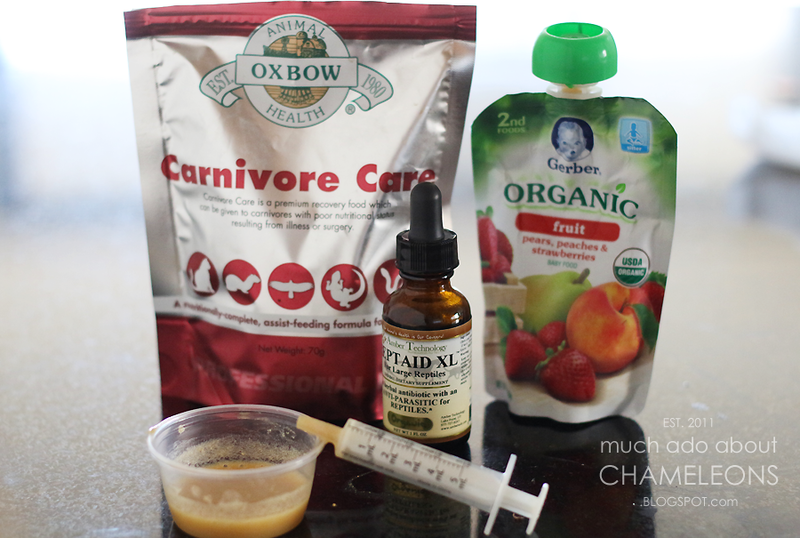 I am going to supplement her diet in the next few days with a little Carnivore Care (which is a powdered food diet specifically for carnivores that need the nutritional boost) because her mouth is sore, which makes shooting at and eating insects difficult for her. And because the last thing I want her to do is to lose weight (especially if we have to start on something stronger, like antibiotics) I don't want her to be weakened at all. Additionally, I have been chatting back and forth with a fellow melleri keepers and we believe that we may be missing something from their diet that they would get in the wild, and my guess is that it may be higher levels of protein or some other nutrient that is specific to vertebrate food, whether it's fatty acids or whatnot. 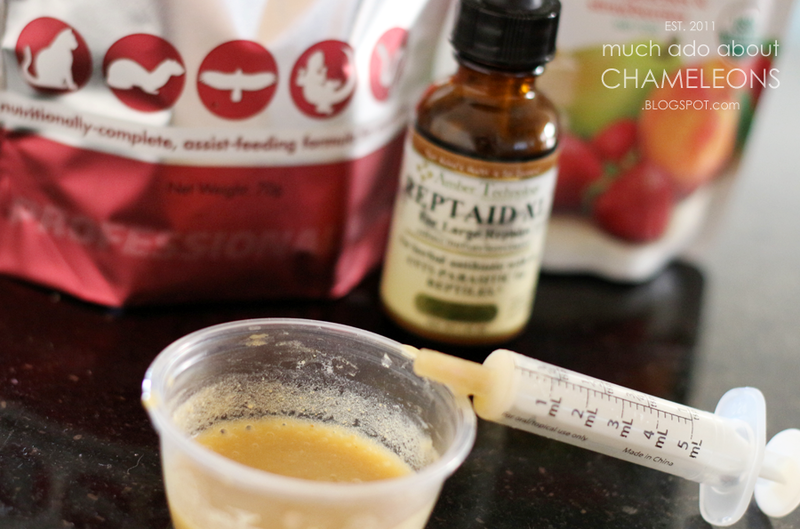 I am also mixing in organic baby food (checking for no added sugars, salts, etc.) to sweeten the mix, as Reptaid tastes pretty awful. So between the Reptaid, the insect diet supplemented with Carnivore Care, and perhaps some use of the Silver Sulfadiazine cream on her gums again I hope we can get the infection to subside without using anything too harsh on poor Guinevere. And in the meantime I will document my findings with this product in a few weeks and give my honest review about the product. And then in a few months I hope to do a second review of the product, in how it has helped Guinevere long-term. If the infection disappears and does no reappear (or if it does), for example, I want to include it in that second review. So, wish us luck! And I would love to hear any first-hand accounts of how Reptaid has worked (or not) for your animals, so please leave a comment about it below. Hi, how is your chameleon doing?, did the products work? She seems to be doing Ok so far, thank you for asking! I haven't seen a night and day difference but I do see subtle improvements so we'll see. I still want to wait a couple more weeks before doing a review. She seems stronger to me so that's a plus! Any updates on the Reptaid? I'm working on a part II right now, but unfortunately Guinevere did not make it. After a handful of weeks I was not seeing any dramatic changes for the better so we returned to the vet for tests and medication. She seemed to be doing fine, eating and acting relatively normally, but passed away in her sleep one night. We're sad but we know we did anything and everything for her, and that she lived like the queen she was for almost 2 years with us.